…at Encore Las Vegas is one of Las Vegas’ premier DayClubs. Featuring 26 cabanas and 8 bungalows, each with refrigerators, flat screen TVs and plush velvet seating. Water, sun, and music mesh at Encore Beach Club for a unique pool experience. Patrons can enjoy lilypad beds and lounge chairs directly in one of the 3 tiered pools or cool of with cocktails at one of Encore Beach Club multiple bars on either side of the venue. Post up near one of three raining ‘wet-pole’ dancespots on ends of the venue to watch the beverage-influenced tan bodies perform their best pole dance impressions while being rained upon. Or head toward the DJ booth to enjoy some of the worlds top DJ talent perform their hit songs. 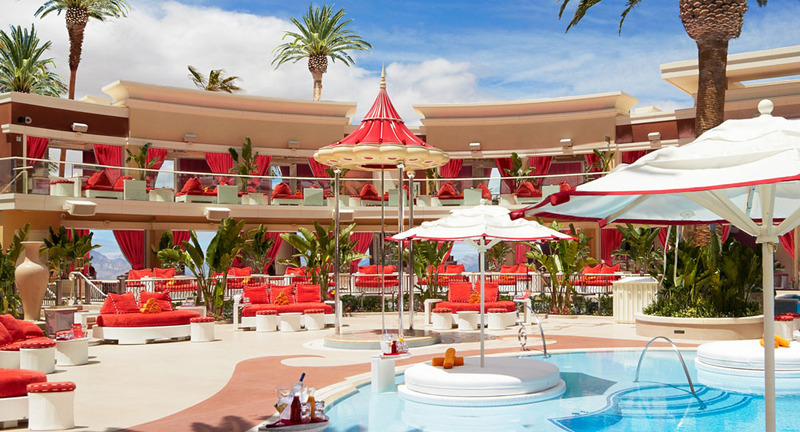 Encore Beach Club is unique and beautiful through and through. Contact one of our VIP hosts today to discuss events and VIP Table & Cabana options. Didn’t get enough during the day? This venue also plays host to Surrender Nightclub at night. Enjoy! Visitor cover is $30 for women and $40-60+ for men. Encore Beach Club pool access is granted to those with Sunbathing/Swim attire. People without proper swim attire will not be allowed to enter pool areas. European bathing is not permitted. Important: All entry to Encore Beach Club is based on management’s discretion. Any person who refuses to comply with any regulation governing public bathing or swimming facility or any rule of that facility must be excluded from the premises.